Xiamen Air began service between Amsterdam and Xiamen with their Boeing 787 in July 2015, their very first European port. 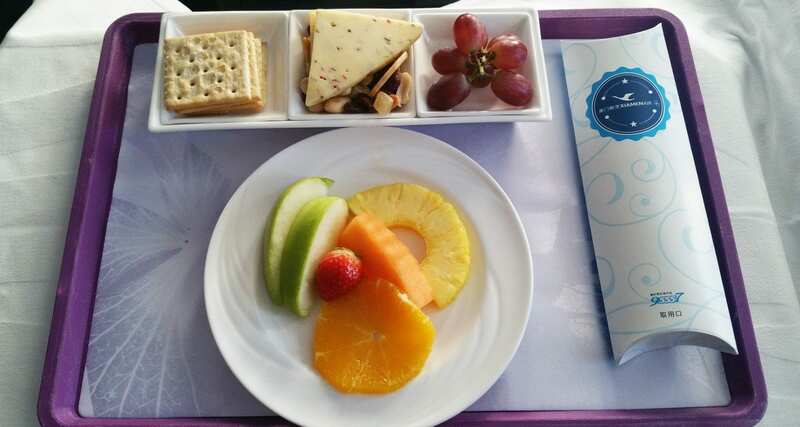 The flight is also the very first Chinese airline experience for Mr Inflight Feed and what an experience it was! I took a total of four flights with the airline starting in Amsterdam then onto Xiamen, then over to Hong Kong and back to Amsterdam the same way. 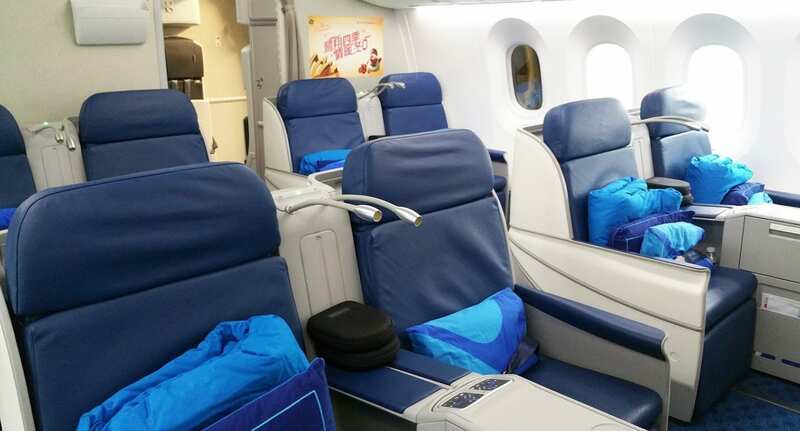 The below is what was offered on the airline between Amsterdam and Xiamen, for further information check out the youtube video at the end of this story! A warm welcome awaits with inflight menus, noise-cancelling headsets, pillows, blankets, and a traditional Chinese tea drink before take off. There are two business class cabins on this aircraft, that are in pristine condition. Right after take off it was time to order the main meals for this 11-hour flight to China, the lunch options included Chicken, Lamb and Seafood and I opted for the chicken. 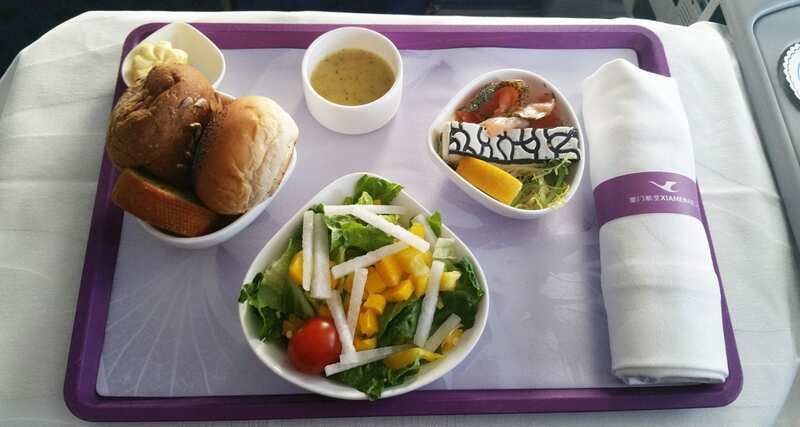 In business class Xiamen Air serve all meals on their signature purple trays, for those in first class, there are no trays everything is served on your linen tray table. Starter: bread options, a fresh garden salad and a salmon starter. 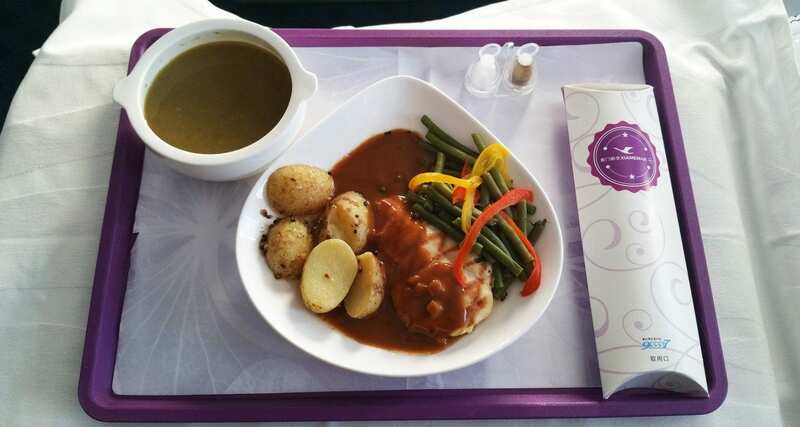 Next up was the main meal option, I ordered the French onion soup served alongside grilled chicken fillet with green pepper sauce, green beans, capsicum and potato. Honestly, it was like dining in a proper restaurant on the ground, the chicken was delicious, the vegetables didn’t seem overcooked and the roast potatoes were delicious. I didn’t expect it to be this good. 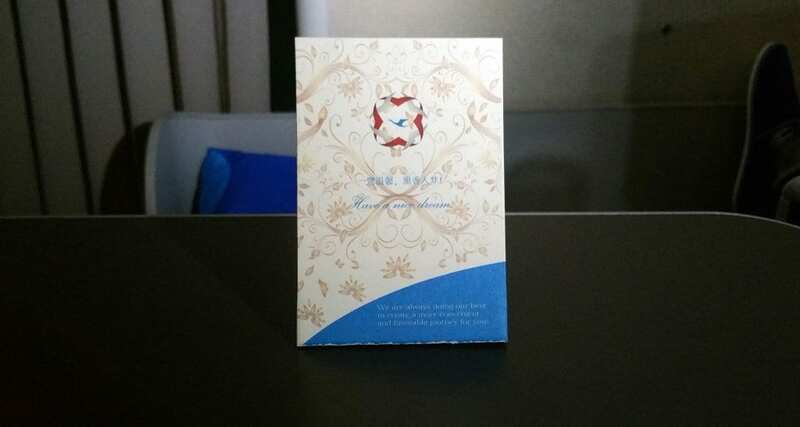 Just before passengers go to sleep the cabin crew walk around the cabin passing out special cards that are infused with scents to make you sleep better, and at dinner time the cabin crew provide candlelight for everyone! 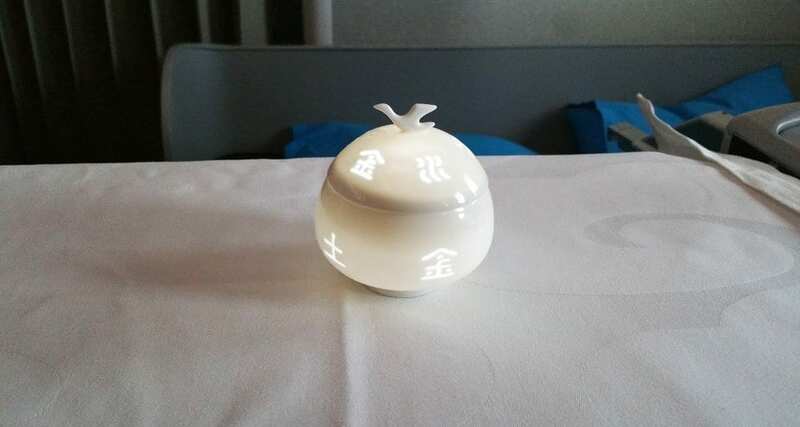 You can take this special candlelight away with you, and it’s only given out on flights between Amsterdam/Xiamen/Sydney. 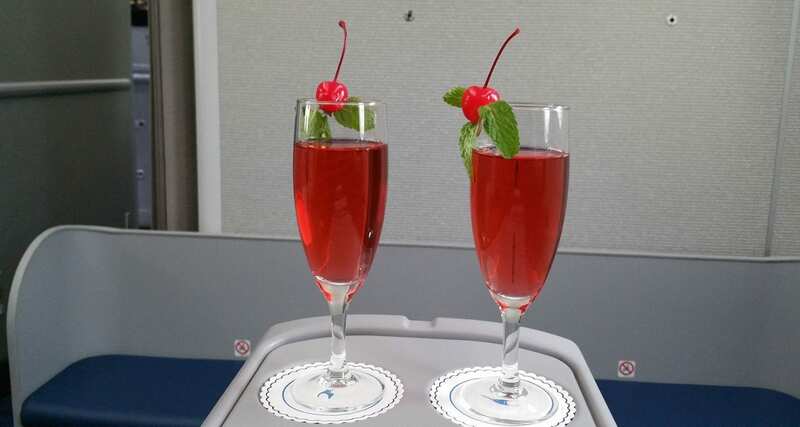 Note that the airline knew that I was onboard this flight and upgraded me at their cost.